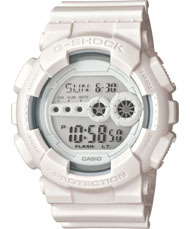 Introducing a whiteout series of models from G-Shock in an all-white monotone coloring. The cases and bands of these designs have a matte finish and utilize mirror LCDs. Their embossed logos are left uncolored and dial plates uncluttered furthering the watches' minimalist look. Matte white resign band digital watch with white face.